A field-study was undertaken in Hamilton, New Zealand to determine if there was an interaction between water-soluble carbohydrate (WSC) reserve content and defoliation severity on the regrowth of perennial ryegrass-dominant swards during winter. Perennial ryegrass plants with either low or high WSC content were obtained by varying the defoliation frequency. At the third defoliation at the one-leaf stage and at the first defoliation at the three-leaf stage (harvest H1), swards were mown with a rotary lawnmower to residual stubble heights of 20, 40 or 60 mm. All swards were then allowed to regrow to the three-leaf stage before again defoliating to their treatment residual stubble heights (H2). Frequently defoliated plants contained proportionately between 0� and 0� less WSC in the stubble after defoliation, depending on the severity of defoliation. There was no interaction between WSC content and defoliation severity for herbage regrowth between harvests H1 and H2. 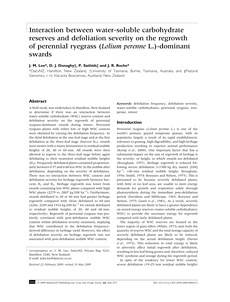 Herbage regrowth was lower from swards containing low WSC plants compared with high WSC plants (2279 vs. 2007 kg DM ha)1). Furthermore, swards defoliated to 20 or 40 mm had greater herbage regrowth compared with those defoliated to 60 mm (2266, 2249 and 1914 kg DM ha)1 for swards defoliated to residual stubble heights of 20, 40 and 60 mm, respectively). Regrowth of perennial ryegrass was positively correlated with post-defoliation stubble WSC content within defoliation severity treatment, implying that WSC contributed to the defoliation frequencyderived difference in herbage yield. However, the effect of defoliation severity on herbage regrowth was not associated with post-defoliation stubble WSC content.